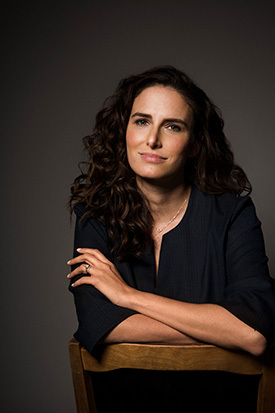 Jessi Klein has it all—or so it would seem. She’s in the process of selling a new television series to Hollywood. Then there’s the voice acting she signed on to do for the animated Netflix series Big Mouth that debuts next year. And a new husband, a new baby son and her first Emmy for her work as head writer and executive producer of the Comedy Central show Inside Amy Schumer. Yet, despite all the outward success, there’s still this little girl inside, unsure of herself and her place in the world. It is that little girl, now a 40-year-old woman, who wrote You’ll Grow Out of It (Grand Central Publishing), a collection of Klein’s personal essays that are insightful, at times poignant, and almost always funny. She looks at what it’s like to grow up when you’re not part of the in crowd, not happy with your looks and not the girl who boys salivate over. “I think that I’ve half grown out of it,” she answers. “It’s everything.” Klein claims she is trying to come to grips with how unimportant her concerns are in the big scheme of things. Consider how much she writes about and discusses her physical appearance. Klein grew up the middle child in “a very culturally Jewish household” in New York City’s Greenwich Village. “My parents were very much into their Jewish identity,” she recalls. She attended Stuyvesant High School, an elite public school, and then went to Vassar College. With that prestigious educational background, she took the natural next step: temping. But the temp job was at Comedy Central, where she eventually landed a regular position as a development executive. You’ll Grow Out of It describes how, in fits and starts, she slowly started to perform at night, first for free at open mic nights before getting paid gigs. But not enough to be confident about her comedy work. In one of the worst moments in the book, Klein recounts the story about being offered a contract to write for David Letterman’s show. She’s excited at the breakthrough. Her mom is excited. But dad tamps it down when he discovers it is just a 13-week contract. “Well, that doesn’t sound like much of a job at all,” he says. Klein turns Letterman down. It all works out. Eventually. She lands the gig with Amy, whom she met on the comedy club circuit. Klein is responsible for some of the hit show’s most widely viewed sketches—including the one about the last day actresses are considered sexually attractive. That’s not the skit’s real name, which in Schumer and Klein’s wonderfully hilarious brand of potty-mouth humor contains an expletive. She’s not sure what the significance of that is, but it’s probably where her next book will begin. It sounds like a fantastic book and a very interesting life to read about and compare to oneself. She sounds like a Kosher Kurls Kurlfriend!